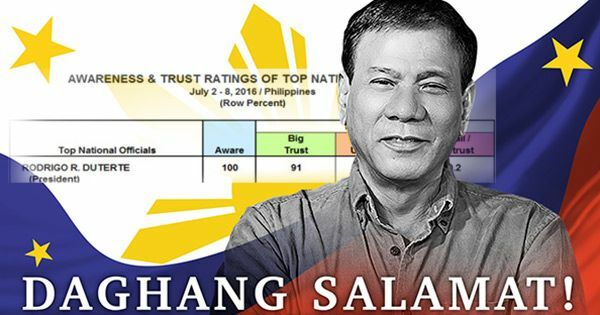 Pulse Asia released Wednesday the results of its July 2-8 survey and said President Rodrigo Duterte enjoys a record high 91% trust rating. Malacañang, of course, was elated of the news. Presidential Communications Secretary Martin Andanar in an official statement thanked the Filipino people for the overwhelming support to the governance of the President. "This record-high trust rating of 91%, as reflected in the July 2-8 Pulse Asia survey, is a humbling reminder that the genuine and meaningful change that our people aspire for is now being felt," the Palace official said. "A position of leadership is often a lonely one. However, a servant-leader, as they say, has to take people where they don’t want to go, but ought to be," he added. "This expression of confidence, therefore, shall serve as an inspiration to the Duterte administration to continuously make a real difference and make our people’s lives better, safer, and healthier."